The actual color of this Zauberball Crazy is more like the two pinned out than it is in the dawn-light picture on the wood background. What fancy blocking set-up am I using? Four rubber jigsaw-edged floor cushion tiles, with a rally check sheet laid out on top of them – all on the dining room table. I’ve got two twin size flat sheets like this, bought for pennies at a local salvage store. The regular 2-inch square checkerboard pattern may make eye-blasting photographs, but it’s fantastic for blocking to dimensions. Large checks come around every so often, most often in kids’ bedding, intended for proto-race car drivers. Oversize gingham and Tattersall plaids are ultra-trendy right now. They would also work well as blocking backgrounds. 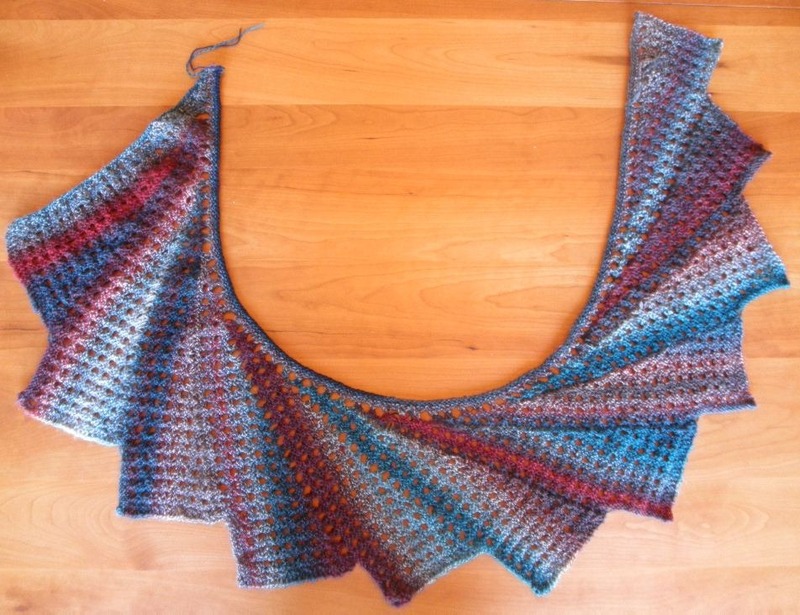 I haven’t worked this Wingspan pattern out of my system yet. I’ve got one more ball of long-repeat hand-dyed sock weight yarn. 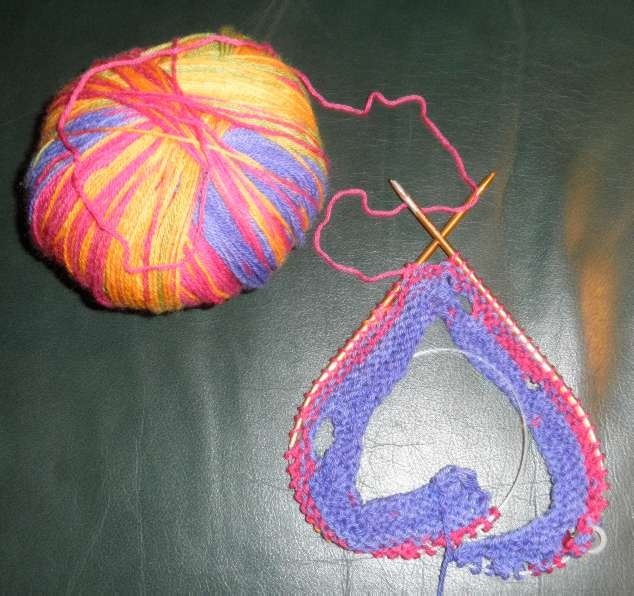 My new yarn is mixed neons – very circus balloon like. This one has lost its tag, but I’m certain I found it at Wild & Woolly about a year or so ago. I like the lattice work double eyelet texture I used for this second scarf, but I want to try something more… unexpected. I want to play with eyelets and this design, using a multicolor. But I don’t want to do the same regular lattice that I just finished. I want to make something more like Swiss cheese, with eyelets of random size and spacing, to pick up on the airy, light-hearted colors. You can just make out a couple large and small eyelets in the purple stripe. How to achieve random size/placement? Remember these? The small eyelet is defined as a K2tog-YO2-SSK unit, with the YOs worked KP on the next row (a two-row double eyelet). Large ones are a bit more complex. They take three rows to complete – K3tog-YO3-SSSK as the base eyelet unit. On the next row I do another YO3 when I get to the hole. On the third row I work KPKP into the bottom YO3, encasing the horizontal strands left behind working both YO rows, and restoring stitch count to the original number. Yes, that’s a YO3, not a YO4, even though I’m working four stitches into the open space. I found by trial and error that YO3 made a less floppy, neater looking hole. I haven’t seen this particular three-row mega-eyelet documented anywhere else, but as with all knitting – I refuse to believe that I’m the first to think it up. I’m sure there’s a reference book citation for it somewhere. And using dice to introduce randomness isn’t an original idea either. There’s a whole school of aleatoric and indeterminate music that in addition to encouraging performers to take a major role in deciding how a piece is played, often employs mechanisms of chance (including dice) to add immediacy and uncertainty to its base compositions. 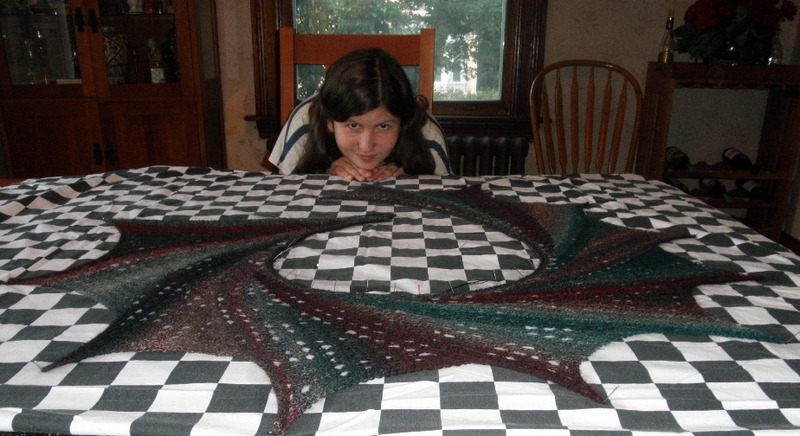 Other knitters have used dice to determine stripe width or repeat, motif placement, or color choice. So there you have it. 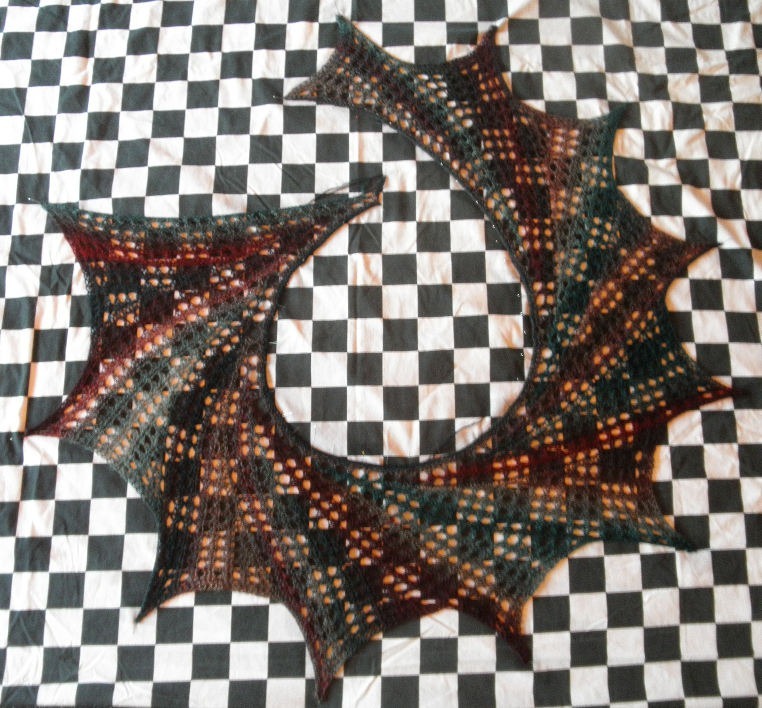 Second Wingspan finished. Third, if luck holds out and this method produces something attractive, will be a bubbly, swirly Swiss-cheese of candy colored neon. If it does I’ll have to find a recipient whose idiom encompasses bubbly neon color scarves. And if it doesn’t I’ll rely on one of knitting’s prime virtues: The ability to reduce worked materials to their pre-project state, ready to begin something else. * Another knitting-related use for polyhedral dice is as row counters. Put one next to you and advance it one number for each row (or stitch) that needs tracking. I’m so glad you’re here on wordpress as every time you post I get an email! It will be so much easier to keep up with you. And you are one of my inspirations, just added you to my list of links on my blackwork blog. Already had you on one of my others!